Godrec market themselves as a contemporary label. This conjures up as much fear in me as it does interest, as either I am going to be treated to experimentation that excites me, or will be ultimately dumped on the scrap heap of artistic nonsense. 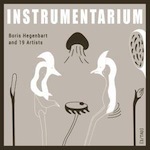 Hegenbart and his 19 colleagues (of which I have zero knowledge of) provide 18 tracks split over 2 LP’s. Obscurity ensues the moment the opening notes filter through the speakers as analogue sounds and instrumentation hit in freeform fashion and it takes a while to bed in. Luckily with such a collaboration, the variation on this release provides an interesting jaunt on more than one occasion; the interaction of Martin Siewert being a standout moment, as sub jazz leanings provide an altogether darker perspective and atmosphere. There literally is so much to consume with a release of this nature that a healthy balance of genres seep through the recordings. Styles flirt with ambient textures and on the odd occasion delve into electronic circles, especially in structure and form. There is the odd meandering into art noise territory and hand on heart, these are elements that don’t fit my tastes when it comes to music; in the past I would just pass these off as a general waste of my time. However, the key difference with Hegenbert’s work on this album is that everything seems to have purpose and is paramount to the full story of what he is trying to achieve, which is an altogether lengthy and varied album, bridging the gap between the obscure and the more commercial aspects of some genres.